Collectorz.com Comic Collector 4.0.0.2 is cataloging software developed by Collectorz.com. Catalog your comics automatically, no typing. Just type the series name and select the issues you own to download all data from our online Collectorz.com Comic Database, including publisher, publication date, creators, character, genre and the cover. Browse your collection by series, publisher, artist, etc... or use the Image View to view your cover images. Sort and group on any field, print lists and export to your iPod, to HTML, CSV or XML. This home & hobby software is shareware, which means you can download and use Collectorz.com Comic Collector 4.0.0.2 for free during the trial period (usually for 30 days). At the expiration of the period you will have to buy the cataloging product for $39.95. Collectorz.com Comic Collector 4.0.0.2 is available at regnow and Collectorz.com website. Collectorz.com Comic Collector 4.0.0.2 supports different languages (including English, German). It works with Windows 98/XP/Vista. 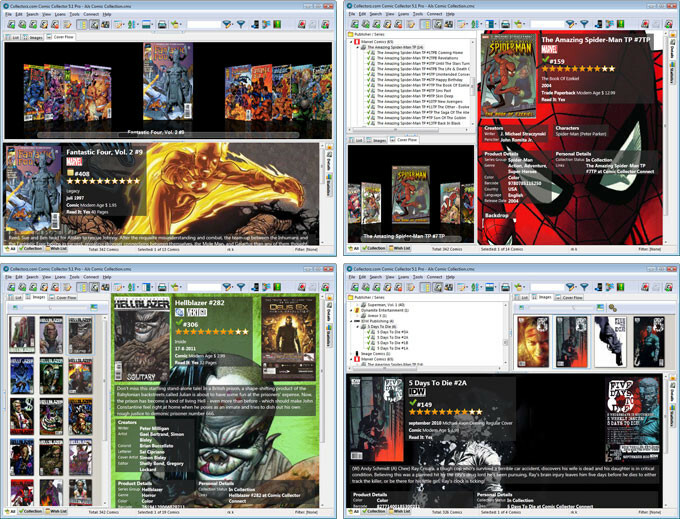 Latest Collectorz.com Comic Collector 4.0.0.2 does not contain any spyware and/or advertise modules, allowing installing it with no worries concerning valuable information loss. Our website has thoroughly tested home & hobby product Collectorz.com Comic Collector 4.0.0.2, written the review and uploaded installation file (7003K) to our fast server. Downloading Collectorz.com Comic Collector 4.0.0.2 will take minute if you use fast ADSL connection. The Big Comic Book DataBase brings you this widget to allow you to search the DataBase directly from the desktop. The Missing Comic is a simple application that helps comic book collectors keep track of issues missing from the titles being collected.